I was over visiting Grampy and You, and they have posted a picture of their new "baby," Claudia. After oohing and aahing over their newest addition, I realized that I have not posted any pics of our new baby, Sheba. I need to get a close-up picture so that you can really see her adorable face, but for now, this is all I have. 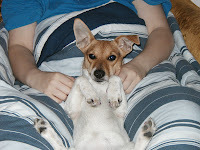 She is a Jack Russell Terrier, and she was a rescue dog that we adopted from our local vet. She is such a lovely dog and fits right in! Have any of you adopted a rescue dog? Ohhhhhh! Super cute. I can't think of a more wonderful gift for the holidays. I'm off to clean. Yay fun! So Cute! I did get one of my cats from a shelter. What a great feeling. I love Jack Russel's, they are so cute. Thank you for stopping by and wishing me well. Hi, I missed you!!! Have a happy Friday!! My head is still cut off and I reloaded my picture half a dozen times!! UGH! !